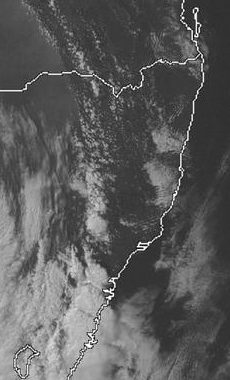 A trough line and cold front was forecast to sweep across NSW during the day as an intense low pressure system formed over Bass Straight. The temperature gradient was quite remarkable with 850 temps dropping from 24 to 6 in just 200 kilometres! 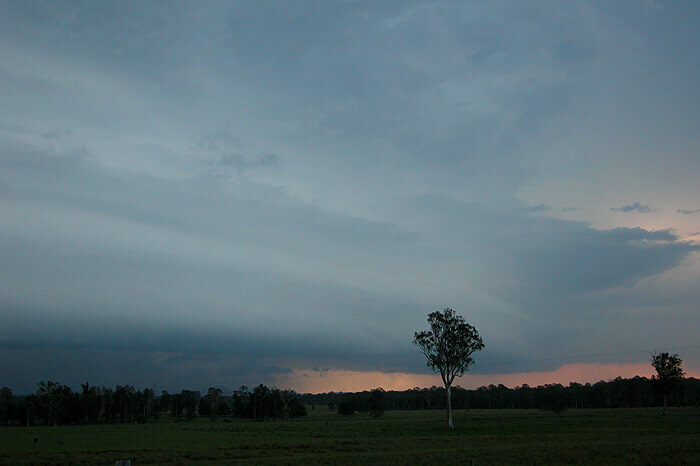 The timing of the trough and the strong capping in NE NSW was of some concern, but storms were still expected. 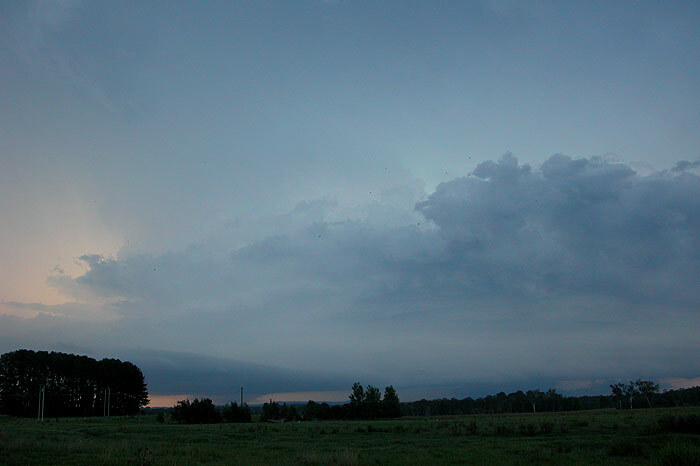 It was hoped severe storms and possible supercells would form ahead of an evening squall line, a development that occurs in the region from time to time with setups like this. Dew points were in the low to mid 20s and a fresh to strong N-NE wind persisted throughout the day. The sky was hazy and only a few small cumulus occurred well into the afternoon. Shear was likely to steer storms towards the SE initially with stronger cells heading E or perhaps NE. 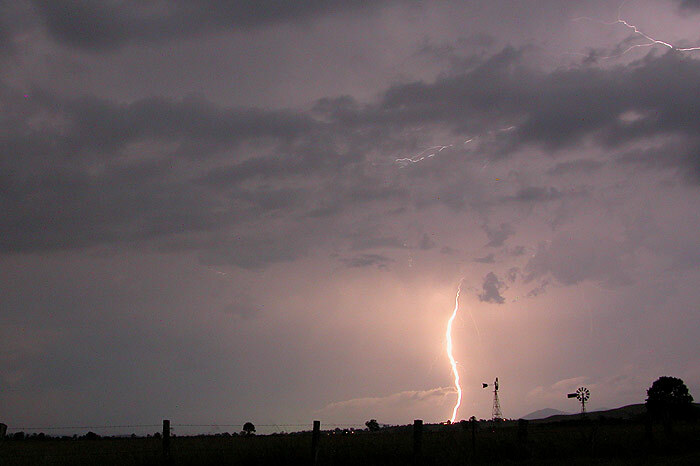 Very strong storms were occurring in the Sydney and Central Coast areas. 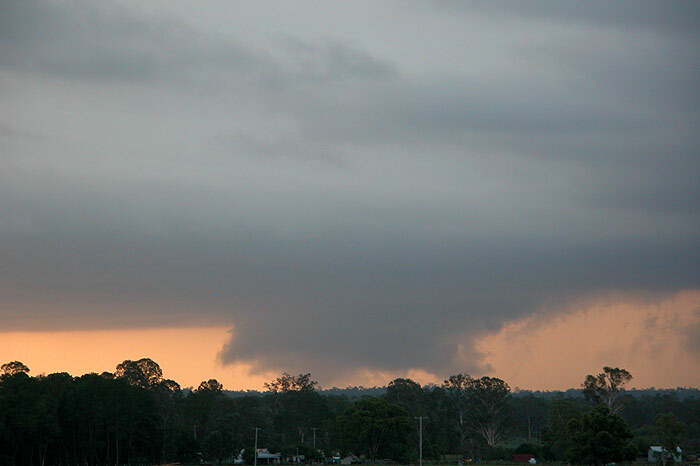 A tornado was observed in Sydney and giant hail hit the Central Coast. It was not until 4pm that local activity commenced just west of Tenterfield. 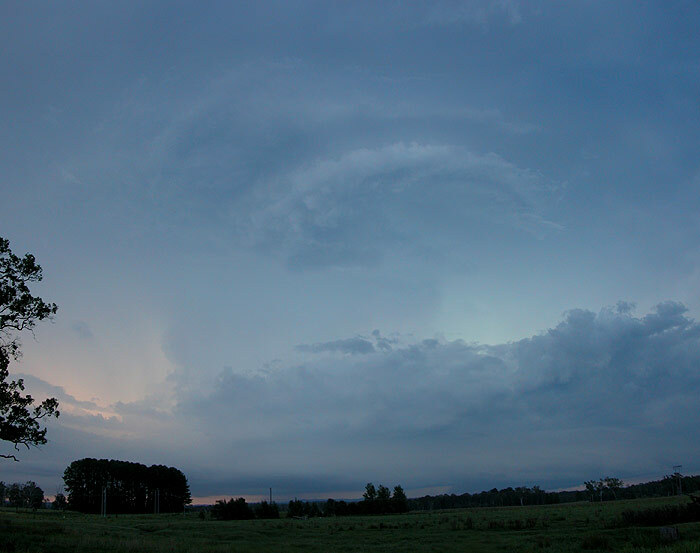 There was a little indecision about when to head out on chase, but the timing ended up pretty good. Dave Ellem and I were in one car with Rodney Wallbridge and Beck Armytage in the other. We headed west and then south along the Summerland Way from Casino hoping to intercept a storm moving initially SE towards Grafton. 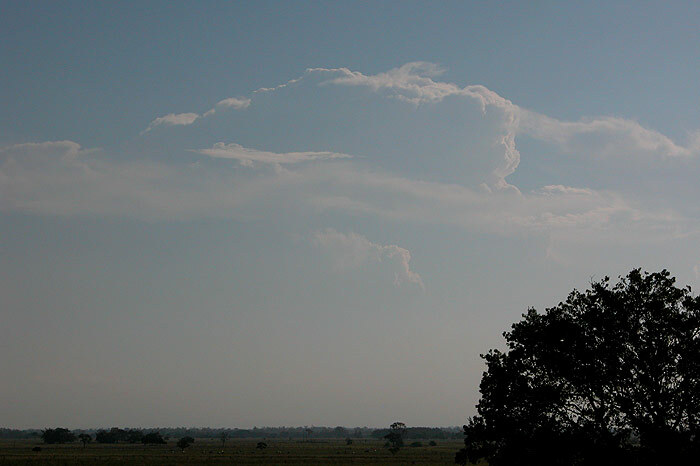 It was hard to observe the storm at first through the haze and poor contrast, but what we could see was very encouraging: powerful vertical updrafts with thick rapid formation of backshearing anvil knuckles. 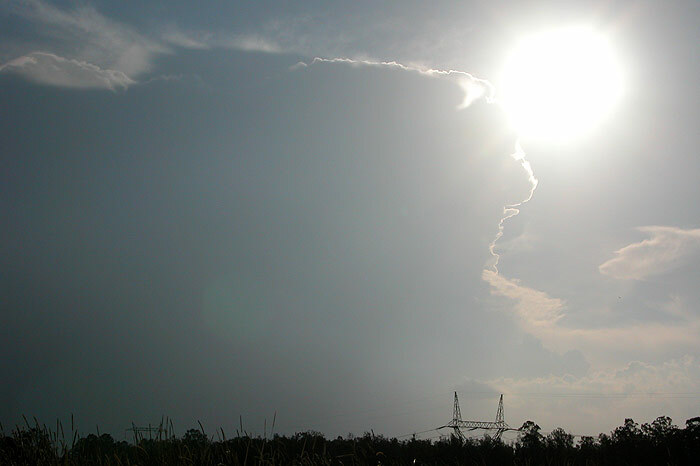 About 35 km south of Casino the sun finally passed behind a storm updraft. 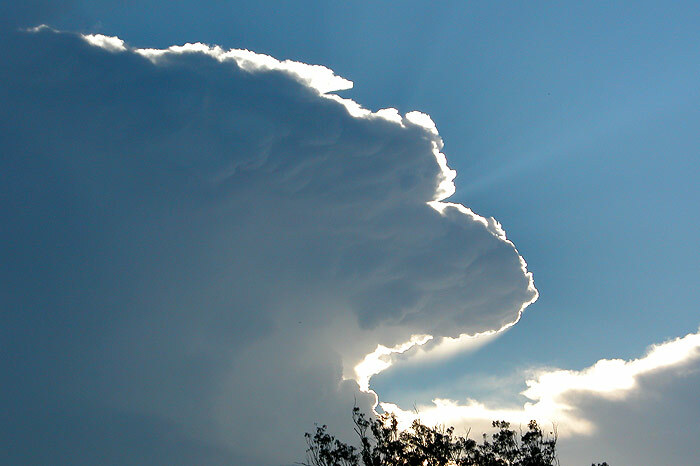 It was an exciting moment as the better contrast revealed the strength of the updrafts ! It was also apparent that the storm was likely to be heading east now. We raced south to Whiporie to find a good vantage point. The Summerland Way has far too many trees and good viewing spots are quite limited. 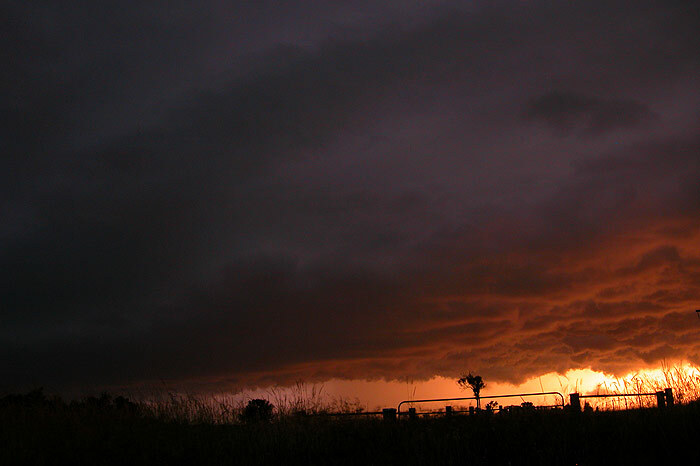 By 6.40pm the storm was looking quite spectacular to our west. 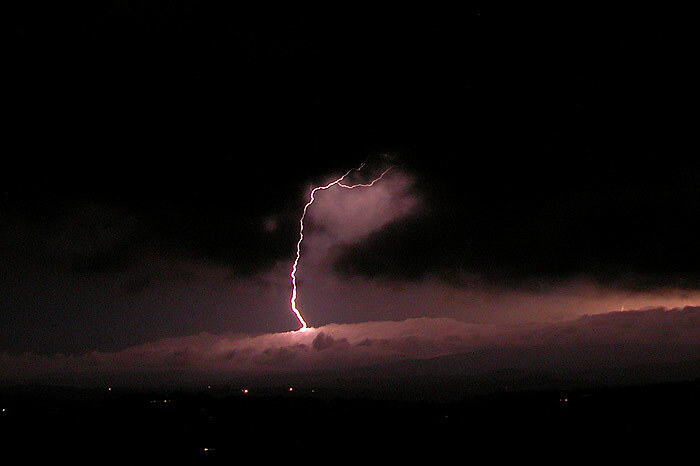 Lightning was constant though not often visible apart from some amazing anvil crawlers. 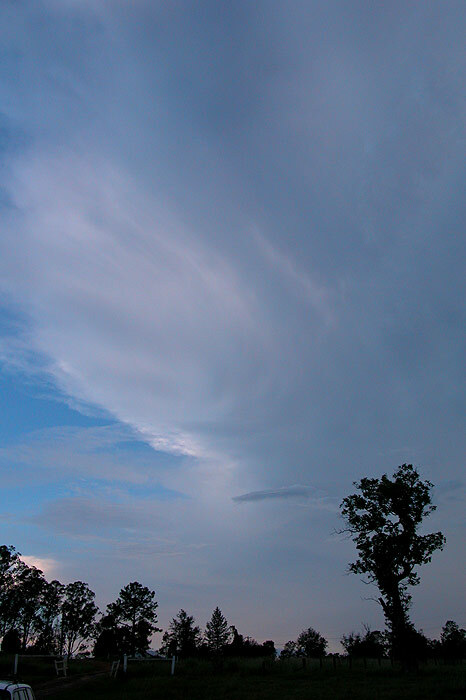 The anvil was thick and two powerful updrafts were apparent at times. 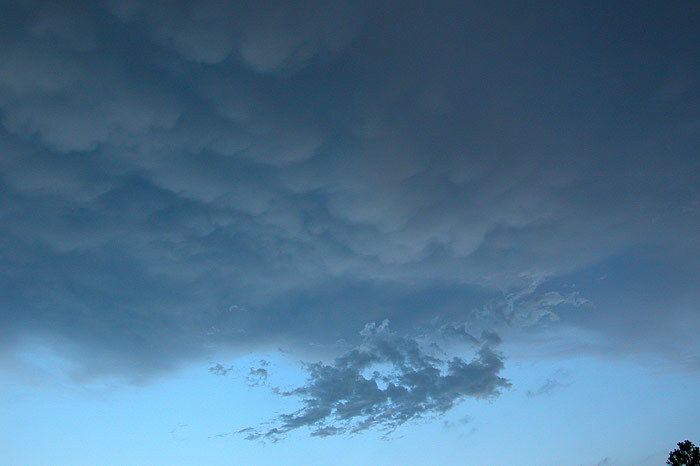 We could also see further activity to the NW, with one cell producing a spectacular field of mammatus almost overhead. 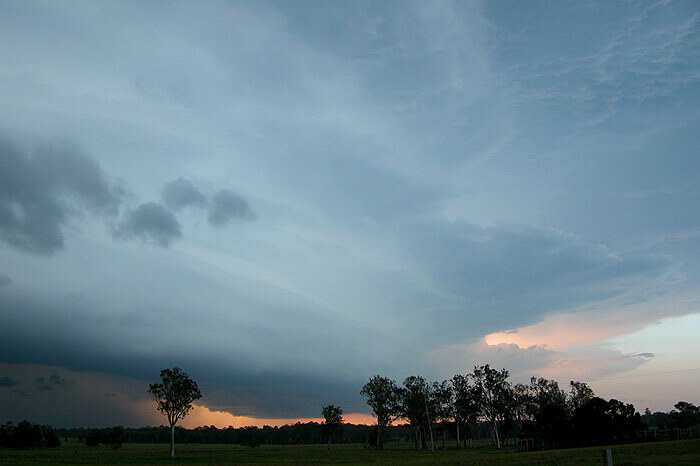 The storm took on some supercell characteristics from inflow bands, spiral like updrafts and laminar banding in the higher levels. We eventually moved to a slightly better vantage point at 7.15pm. 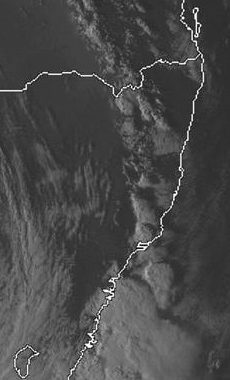 It was becoming apparent that a line of storms had developed and a very large highly organised gustfront was moving towards the ENE or NE. At one stage it seemed a mothership type structure was forming. 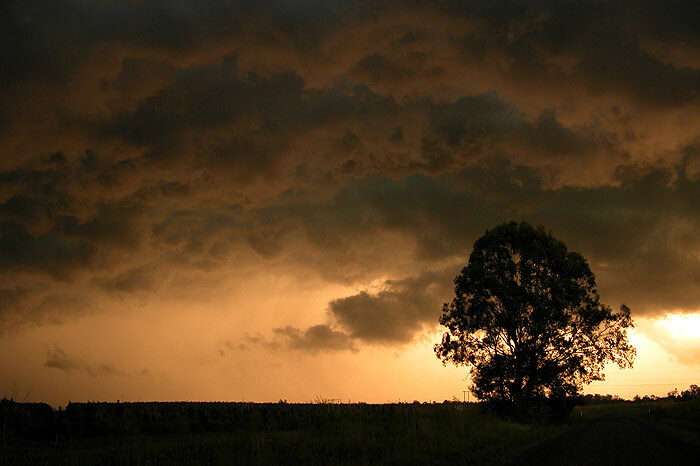 We stayed as long as we could then headed back north to stay out of any severe weather. 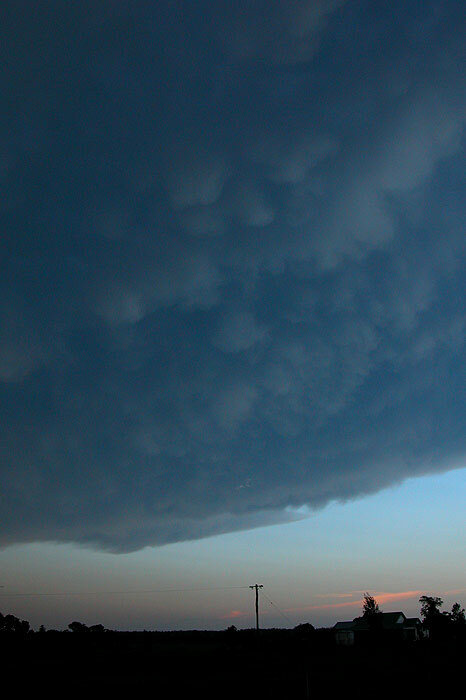 The turbulent sky under the gustfront was awesome. Powerful CGs hit behind us, though both were often obscured by trees! We did find a couple of locations to stop and take photos though. 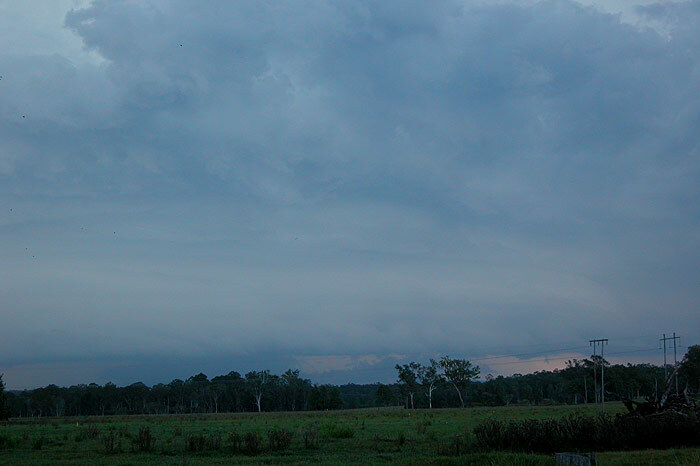 The storm soon weakened with the guster well ahead of the updraft. We hoped the line of storms would continue further north so moved to a spot just NW of Casino. 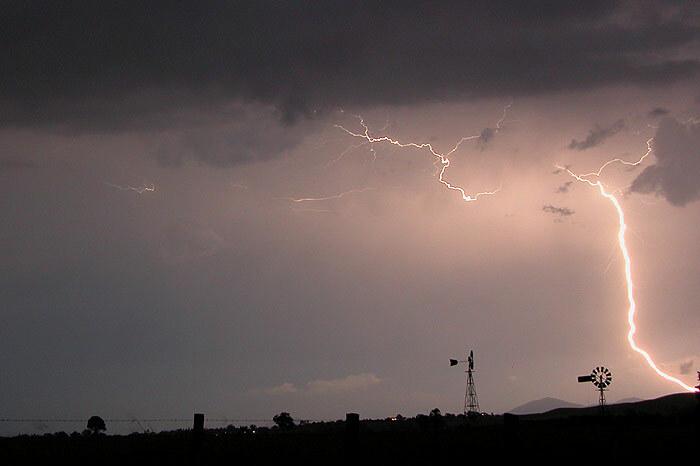 It was now 8.30pm and dark so it was all about a lightning show now. 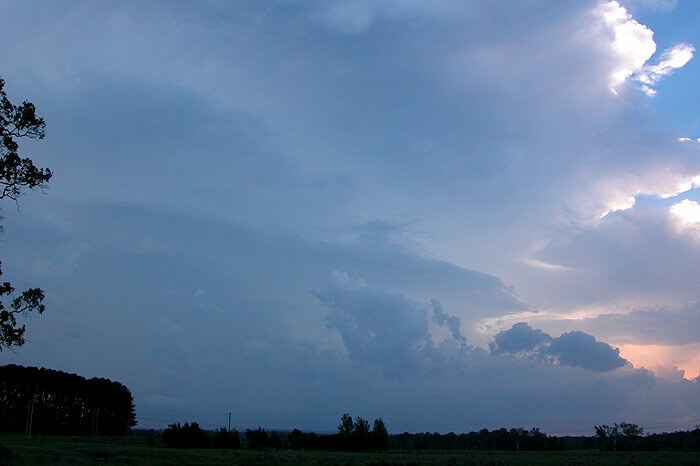 A storm to the north spat out infrequent CGs and awesome anvil crawlers at times. A little drizzle at our location made it a bit difficult to photograph. One CG hit less than 2km from us - the image burnt into our eyes for quite a while afterwards ! 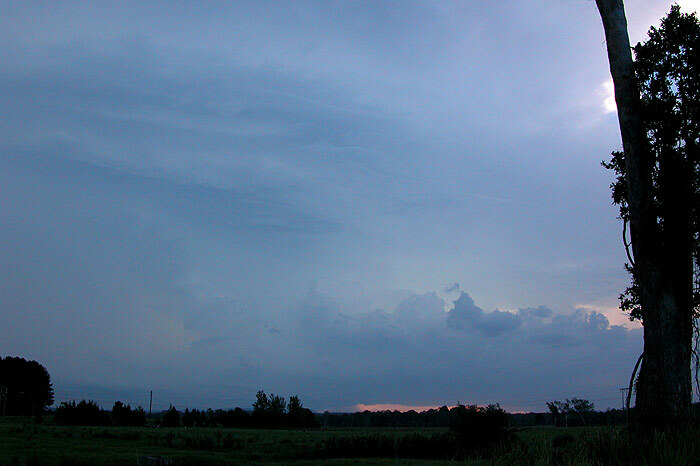 Other cloud eventually got in the way and we could not tell initially if lightning was active further to the east. 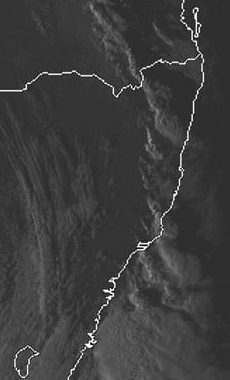 The decision was made to head east and set up from home - hoping that cells along the border with Queensland would be giving a nice show. 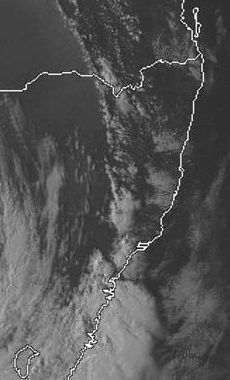 This proved a good move with an amazing show persisting till after 11pm - eventually mucked up by outflow stratus. 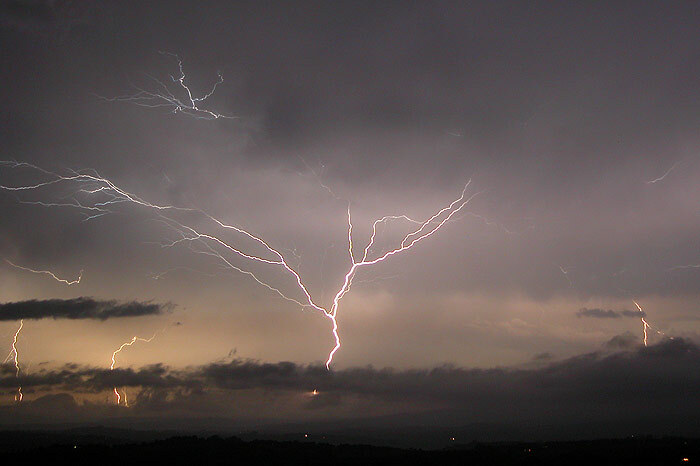 The anvil crawlers were the highlight along with several ground to cloud (GC) lightning - a much less frequent form of lightning that occurs when the stepped leaders originate from a structure on the ground and branch upwards. 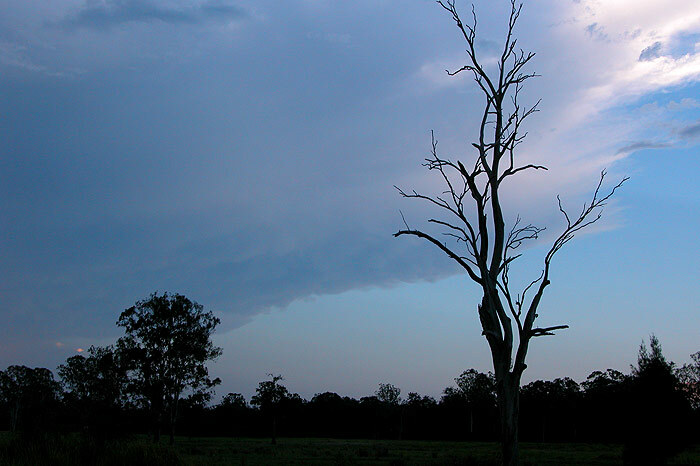 Many of these appeared to occur from the transmission towers on Mount Nardi in the Nightcap Range. Consequently one local television channel went off the air until later the next morning.